Urban Decay 24/7 Waterproof Liquid Liner Review! I am a huge liquid eyeliner fan! I prefer liquid over pencil, shadow and gel and am always on the hunt for the next great liner. I am pretty partial to my Kat Von D liner but when I heard that Urban Decay came out with new liquid eyeliner’s I knew I had to try them out. So I made my way to Sephora and checked out the Urban Decay display and after playing with a few of the colors and hearing rave reviews from all the girls working there, I picked out one to take home and play with, and I must say I am pleasantly surprised. I tried out all the colors and although my mind was leaning towards black I decided to go with something that was a little different from what I normally wear. All you ladies out there know that you always have a mini panic attack trying to decide on a color when there are so many good ones to choose from, and I was the same way. I knew I would use black more but I have 2 other black liquid liners, 2 black gel liners, and 2 black pencil liners. Does a girl really need that many options to create virtually the same look, with a minor textural difference? I decided to go for something that was completely different from anything I own. 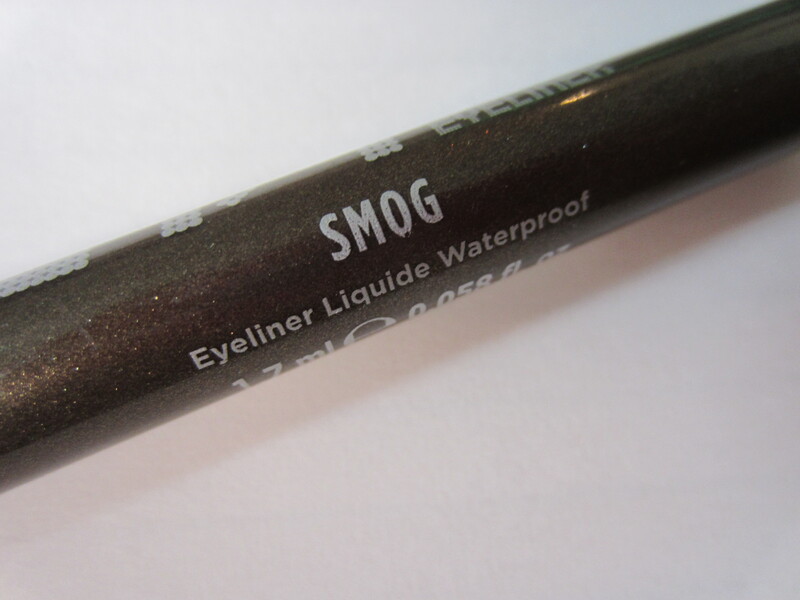 “Smog” is a ultra shimmery olive toned brown. I’ve been way into colors like this for the last 2 months. I have been wearing my olive nail polishes, eye shadows, and now eyeliners. Urban Decay also has an eyeshadow called smog that is extremely close to this liner but they aren’t exactly the same so they can be paired together in a neutral eye look. Before I start talking about the color I want to rave about the applicator. Based on the packaging, I expected the applicator to be a felt tip applicator. 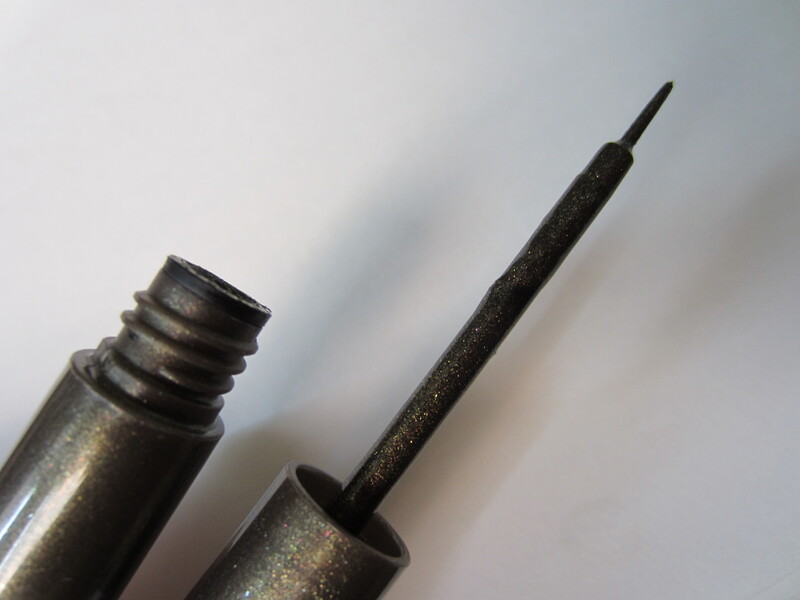 If you aren’t a liquid eyeliner girl, then let me take the time to say that there are 3 different types of applicators that you will find with liquid liners: felt tip with product that continuously flows into the felt from inside the tube, a felt tip that you can to dip into a pot or tube full of the product, or a brush that you can dip into a pot or tube full of the product. There are pro’s and con’s with all 3 and mostly it comes down to which one is your personal preference. I personally hate the felt tip liners with continuous product because they dry out easily and you don’t always get an easy and smooth application. The type of liners where you have to dip the applicator into the tube is more my style. But with a brush, you have more control over the size of the line you create. After a really long explaintation about liquid eyeliners I must say that I love this applicator. It’s the brush style applicator and this brush is thin enough to create an extremely thin line or a thick like if that is what you prefer. My style is a thinner line and I have no problem creating the thinnest line with this product. 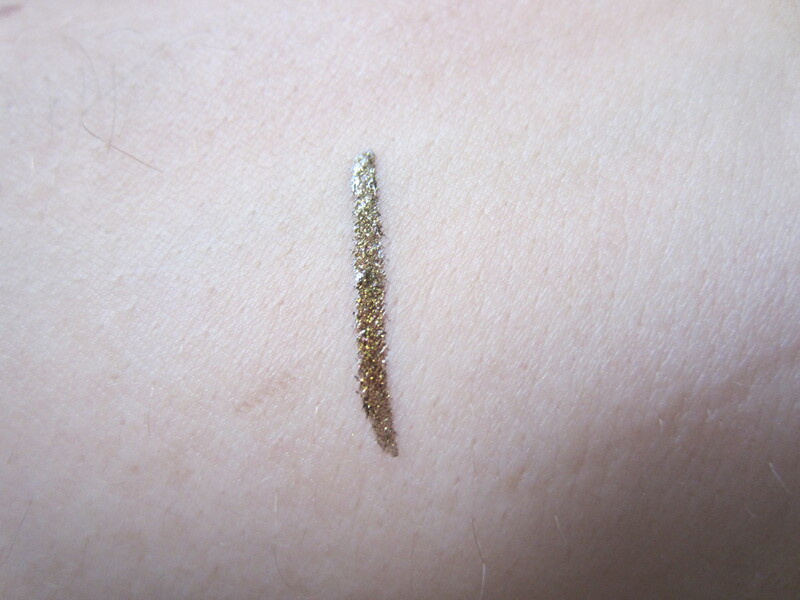 About the color, this super shimmery neutral is amazing! This color is shimmery enough to really stand out against my lashes even when I put a ton of mascara on but its still soft enough and neutral enough to not have the harsh effect that black liner has. It has become one of my every day makeup staples because it still stands out but doesn’t make me look really made up. This seriously makes my green eyes pop and I can’t say how much I really like this color. Also the ease at which this goes on is something to brag about but also the ease at which it comes off. I get a little nervous about waterproof products because I hate how hard they are to get off. This product on the other hand, is a breeze to get off. It comes off in larger chucks, sort of like large flakes, rather than how normal eyeliner comes off which is like a gradual fade. It seems to chip off but only when I use either makeup remover or a face wash. It comes off easier than a lot of my non-waterproof products but it doesn’t budge at all after it sets. This truly lives up to the name 24/7 because this will not come off your eyes unless you take soap or makeup remover to it. I left it on over night once and when I woke up it looked as if I had just put it on! Granted the rest of my makeup looked extremely pretty, my mascara seemed to want to say hi to my blush, but the wing of my eyeliner still liked like I had just applied it. Overall, I am very happy with this eyeliner and would love to go back and get every single color. The only negative that I can think of is that it takes a while to dry. This eyeliner definitely is one of the slowest drying eyeliners I have ever used so it adds some time to my makeup routine in the morning. I have to wait a while before I apply my mascara because the eyeliner will smudge all over the place if I dont. But there is a positive to a slow drying eyeliner, if I mess up I have time to fix it before it sets. I have time to make sure my eyeliner looks perfect before it sets so a slow drying liner can be a positive or negative. I am getting really picky right now looking for a flaw but I am extremely impressed with this eyeliner and would recommend it to anyone. Try this out, I promise you won’t be disappointed. Has anyone tried this eyeliner out? If you did, what do you think? And if you haven’t, are you more interested now? September 29, 2011 in eyeliner, Makeup, Product Review. Urban Decay Naked 3 Palette Swatches and Review!